If you’re looking to play a round of golf in Oahu, a SpeediShuttle service is a great way to start. Reserve your tee time on the course of your dreams and book your golf shuttle with us. 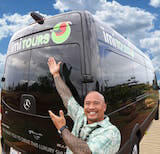 We offer shuttle transportation to Oahu’s finest golf courses as well as Maui, Kauai, and Hawaii. With a golf charter shuttle service, pick-up times are flexible so you can golf on your own schedule. Reserve a golf shuttle in Hawaii with SpeediShuttle and hit the links with us! Our charter shuttles include Mercedes-Benz luxury shuttles with room for 11 passengers and spacious interiors with six-foot clearances. Perfect for groups headed out for a day of golf and plenty of room for clubs. SpeediShuttle operates throughout the entire state of Hawaii and can provide golfing transportation packages in Oahu, Maui, Kauai, and the Big Island. It’s the best way to tee up in Hawaii! Contact us anytime and provide the best golf shuttles and find the best course for you. Explore this golfers paradise with SpeediShuttle! Get a Lei Greeting with your Shuttle! We make the ordinary experience extraordinary!